Rome – Wednesday, 21 November 2018 –Eng. 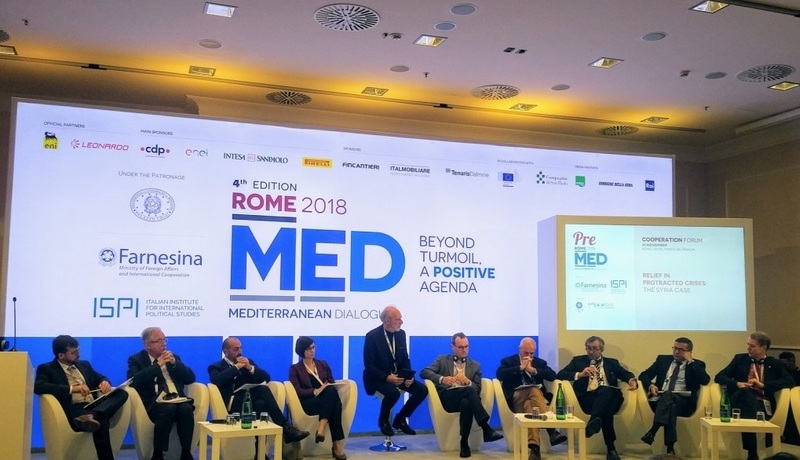 Hani Khabbaz, Director General of the SRTF participated in the Pre-Med meeting of the fourth edition of MED Rome Mediterranean Dialogues: "Linking Relief to Development in protracted crises: the Syria case", today. Organized by The General Directorate for Development Cooperation of the Italian Ministry of Foreign Affairs and International Cooperation (MAECI), the International Center of Advanced Mediterranean Agronomic Studies, Institute of Bari (CIHEAM Bari) and promoted by the Italian Institute for International Political Studies (ISPI), the annual, high-level dialogue conference was attended by top leaders of Mediterranean governments, business, civil society, and media. The main panel discussion was kicked off with a short video on: “Agriculture and Livestock Support of Syrian People.” Among the panelists were representatives from key organizations such as the Food and Agriculture Organization of the United Nations (FAO), World Food Programme, UNHCR, the UN Refugee Agency, EU Humanitarian Aid, The Organization for Economic Cooperation and Development (OECD), The Department for International Aid, (DFID), Gruppo di Volontariato Civile (GVC), as well as, the SRTF represented by its Director General. Addressing the audience, Eng. Hani Khabbaz emphasized the key role of local partners and communities in stabilization and recovery efforts:“ It is local partners, local design away from centralized projects, each and every community has to participate in identifying the needs, designing the system that works for them and then be part of the implementation, management and sustainability of those projects.” The Director General also talked about the SRTF’s recovery and stabilization process plans in the short and medium terms in targeted areas in Syria. The event concluded with a Q & A session with best practices and lessons learnt being highlighted in relation to relief in protracted conflicts.